The WPH Race4Eight Season Opener in Atlanta, Georgia, along with the The Peach Tree Open/Ron Cook Memorial Returns! Special Event: Pro/Am Corn Hole tournament at the Saturday night party. Pros will be teamed with amateurs(donors). Entry fee is a $100 dollar donation (or $250 donation to select the Pro you would like to play with). $100 dollar donors will be assigned a Pro player randomly. Prize money will be awarded to the finalists. Limited spots available. Email your request early to the tournament director. The WPH 2017/18 Race4Eight Professional Handball Tour (season #7) kicks off in Atlanta, GA @ Recreation ATL (754 Beaver Ruin Rd, Lilburn, GA 30047) when the historic Ron Cook Memorial & Peach Tree Open take center stage October 6th-8th, 2017. The WPH will qualify eight players after naming the “Elite-Eight” pros a month earlier. “We will insert the top eight ranked pros, who’ve accepted their invites,” says WPH Executive Director, Dave Vincent. “The Elite Eight will be placed into the main round of 16 and will wait on the qualifiers to fill out the bracket. 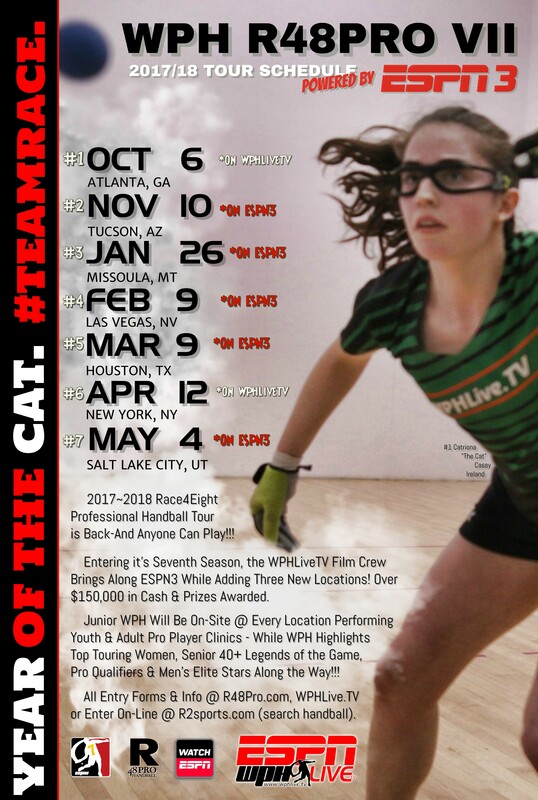 All sixteen players will qualify for prize money.” This will be the seventh season of the WPH Race4Eight Professional Handball tour; where the players will compete in six stops, gather points along the way, then put it all on the line to close out the season in 2018 at the seventh stop–The Player’s Championship in Salt Lake City (May 4th-6th, 2018)!! WPH Qualifiers will begin Friday morning at 9am; Main draw Round of 16 Pros start after noon; Regular local tournament (Ron Cook Memorial/Peach Tree Open) commences after 4pm Friday. The Ron Cook Memorial will feature divisions for skilled and amateur players; in singles and doubles. You can also come visit Recreation ATL in person and just watch as a fan! WPHLiveTV will return in season seven with even more filming hours; however, this stop will not feature ESPN coverage. WPHLiveTV will film and air on www.wphlive.tv to exclusive members. On-line Entry form HERE> Mark your calendar for this event!